Take Off into English Teaching! Planning to become a secondary English teacher? This must-have guide contains everything you need to know before embarking on your training programme. From your reflections on your chosen course and your preparations for interview to thinking about the demands of school-based training, this book encourages you to engage with the challenges of teaching in a realistic and enthusiastic manner. It aims to answer the question: What should trainees know, understand and be able to do before they start the training programme? Written in a practical, accessible and thought-provoking style, each chapter is packed full of reflective points, discussion questions, and a wealth of activities and examples. It explores key aspects of practice, including target setting and progression, as well as observing and being observed, and offers advice on tricky topics such as how to accept and build upon criticism and how to take responsibility for your professional development. There are numerous opportunities to reflect upon your subject knowledge, in order to help you celebrate what you know already as well as to identify what you still need to find out before you begin. 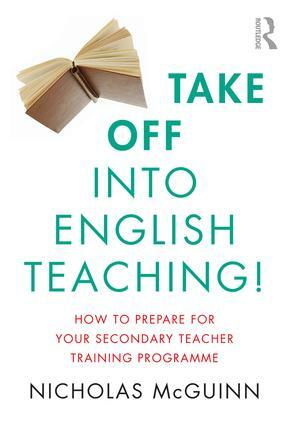 Above all, the book encourages you to think about what English teaching means to you. You are invited to engage with core issues related to theory, curriculum and assessment, before exploring these issues in the context of the school. Although Take Off into English Teaching! is written for trainee teachers and teachers of Secondary English, many of the issues it covers will be highly relevant for school and academic staff, trainees and training staff involved in secondary education generally. Nicholas McGuinn has trained teachers of English and Drama for more than twenty years and is an Honorary Fellow in the Department of Education, University of York, UK.